Wheel bearings have the habit of wearing out on expedition. The constant driving with dust and water creates a testing environment for your hub seals, so it is not uncommon to have a dodgy bearing or two on expedition. I think it's one of the mechanical things that is so crucial and fairly straightforward to fix, that it's worth getting some practice of it before you leave on expedition. If your engine dies, at least you can still move the vehicle. 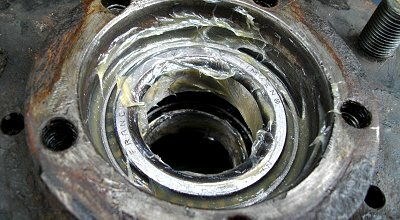 If your bearings collapse, it becomes a lot more difficult. Both my front wheel bearings have MOT advisories for slight play and i've been having a grumbling noise when turning right. I thought it a great opportunity to practise the one mechanical thing that's very accessible, but needs to follow a few pointers to get it right the first time. I've had two crippling breakdowns on expedition relating to bearings. The first, I was in convoy in the jungle when I started to smell burning. I stopped and got out to see the RHF hub cap gone and the stub axle glowing red hot and billowing smoke. We were 2 hours from civilisation and the wheel was wobbling badly, so I limped 5 minutes to a known crossroads and dumped the vehicle, heading back in the other vehicle. The next day we came back with a local budget mechanic who proceeded to, (I now know) dismantle the hub in entirely the wrong way. Later on it was towed back to the proper mechanic and required a new stub axle, hub and everything that went with it. The second occasion, the Defender had been stuck in muddy water up to its arches overnight before recovery was possible. A few days later driving on the highway, there was a loud bang and drive was lost. The bearings had heated up and melted the stub axle to the hub, which then sheared off. These are the photos below of what was left of the stub axle front and back. If your wheel bearings just need tightening, then the first few stages can be done and then reassembled without removing the hub. However, if you feel any roughness as you rotate the hub, then you will also need to replace the bearings. The optional parts can be used again if serviceable. Timken are a recommended make. I have laid out below what I did, what I came across and what I would do differently next time. At the bottom are various Youtube videos that show how to do it in real time. First, lay out your parts. You really need to have them all for this job as you will end up crippling your vehicle once started. Break the wheel nuts and the five 17mm Drive member bolts whilst the wheel is on the ground. Jack the vehicle up (taking the usual precautions - axle stands, etc. ), remove the wheel and the hub cap. Remove the circlip underneath along with a spacer behind it. Remove the 5 bolts completely. Tap the drive member with the hammer and it will come away from the hub. If it sticks then use a chisel/screwdriver to separate it. You will see the hub nuts. My drive member didn't have a gasket or sealant on it at all! A failed drive member gasket is recognisable by grease splattered all over the wheel (right). There are two hub nuts separated by a lock washer bent over a flat of each nut. Tap back the outer tab and undo the nut with your hub nut spanner or 52mm socket. Td5 models (99 on) have a single staked nut, although many might have been replaced with the two nut system. 200Tdi and earlier have a similar arrangement but the cutout on the stub axle is a different shape, hence different washers. The outer nut was easy to remove with a screwdriver on the hub nut spanner. Remove the outer nut and washer, then do the inner nut. Tighening this nut will remove any play from the system. If the wheel bearings are not rough, then you can reassemble from this point. The bearing seemed fine, but I was expecting the replace them so thought I might as well. If replacing the bearings, you now need to remove the brake caliper from the disc. There are two 13mm 12point bolts on the back of the caliper. There are supposed to be done up tight, but mine worringly didn't put up much of a fight. There are a couple of methods to removing the brake caliper. The workshop method is to undo the brake union nut and take the caliper off completely. Another method sees undoing the two bolts on top of the swivel housing which hold on the bracket that holds the brake pipe. I opted for the second method, not interested in having to bleed the brakes afterwards, but the right hand bolt on the swivel pin (left photo, directly underneath the union nut) was difficult to get to and was rounding off. I couldn't be arsed with knackering this nut, so carefully bent the pipe and bracket so that the caliper could be pulled clear, rested it on the track rod and tied it to the spring. The hub will now easily pull off. The outer bearing will be loose so remove it. Turn the hub over and using a claw hammer, lever out the oil seal. Inside was a gunky mess of old grease. Remove the inner bearing. Taper bearings (as used on the hubs of Land Rovers) come in two parts, the inner race (with the rollers) and the outer race. The outer race is set into the hub. The olds ones now need to be removed. The outer and inner races must always stay with their manufactured bearing. You will need to drift the races out. Between the two races in the hub is a gap and a lip on the back of each that you can use to hammer them out. Take your time. The arrow shows the lip of the last race, once one has been removed. Then clean the hub completely of old grease and any dirt. The new races can be hammered in using the old race on top and a metal bar across the top. I used a socket extension bar. The photo a few below shows this. At some point you will have to move to the drift to stop the old race getting stuck. When doing so, hold the drift tight against the side of the hub to prevent it jumping off and scratching the race. This would spell the end of that bearing very quickly. You will know when the race is fully seated as the note changes to a solid metallic sound when you hit it with the hammer. When both races are in, lightly grease the inner bearing race. Grab a handful of grease in a clean glove and with the other, press the bearing into the grease to fill all the gaps between the rollers. Then put it into the hub, matching the inner race to the outer race from the same box. Lightly grease where the oil seal will sit, place it and use the old race to set it into the hub as you did the new race. The seal says to set it at a depth of 4mm. Make sure it is set squarely. I would only ever use genuine Land Rover or Corteco seals for the desire of not wanting to do the job again any time soon! Turn the hub over and the seal will hold the bearing in. Grease the other bearing and place it into the front of the hub. Clean the stub axle and put a smear of grease everywhere between the back and the threads. The collar at the back is where the oil seal sits and should be free of grooving for it to seal properly. Grab the hub and slide it onto the stub axle. I would use a little less grease than is pictured, as the hub wouldn't slide on properly without a hammer. Replace the bearing spacer the same way round it came out. Put on the first nut and tighten it so that you cannot wobble the hub and the wheel spins freely. It sounds a bit hit and miss but i've not been able to find a better term for it all over the internet. The workshop manual says tighten to 50NM, back of 90 degrees and tighten again to 10NM. This is the same process as doing it up tight, seat the hub with a hammer, and tighten again. Place the lock washer next and then the second nut. Bend a part of the lock washer back over the inner nut and lever out another tab and chisel against the outer nut. This will stop them turning. Then you just have to reassemble the drive member. I went for the surefire method of sealant-gasket-sealant. Put sealant around the bolt holes to stop water or grease getting to them. Update: I now don't use a sealant as it makes a mess the next time you do the job. A paper gasket should be fine. Put the drive member on and align it with two bolts. Push or tap the drive member into position and replace the circlip and spacer on the half shaft. Loctite each of the bolts and diagonally tighten them to 65NM. Put your brake caliper back on and Loctite the bolts, tightening to 82NM. Hub cap on and there you go! The RHF front hub turned out to be the one that was rumbling. The grease inside was creamy coloured and like cheese - a sign that water had gotten in. The inner bearing was rough and the race was corrugated. Definitely worth doing that one! There's a few videos out there that have helped me visualise doing the whole procedure. The importance of following the right steps and ensuring a level of quality is imperative as the bearings are the life and soul of your vehicle. I found it good to watch the videos through a few times to become confident with the process. It pays to get good at changing wheel bearings, as on expedition you will more than likely find yourself having to change them! The following videos are a 3 part explanation of the full process by PhilSheredan.